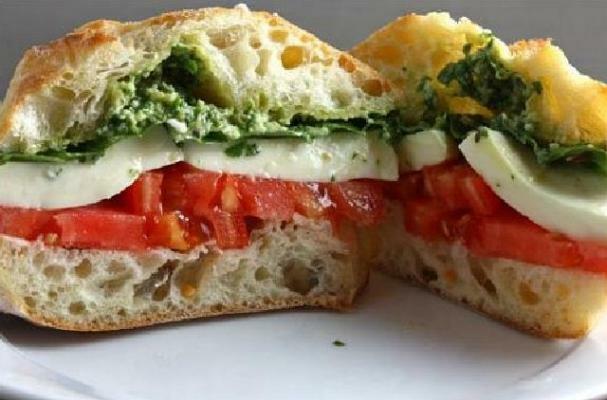 A caprese sandwich is a fresh meatless meal. Homemade basil pesto is layered with fresh mozzarella cheese and thick slices of sweet tomatoes. This sandwich is super simple but the flavors are bright and refreshing. This dish can be on the table in just 10 minutes. Place everything into a food processor and blend, build your Caprese Sandwich so that the pesto peeks through the top layer as it marries with the cheese, which fuses with the tomato, which sits on the bread, which absorbs the virgin oil, which softens the bread, which holds the whole thing together? A rhapsody!